Even as a young girl, Belva knew that she would move mountains. When she decided to go to law school, she wouldn't give up until she found a school that would admit women. When she completed the law school coursework and the university wouldn't give her a diploma, she wrote to President Ulysses S. Grant and demanded her diploma. 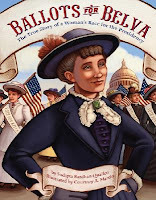 Belva went on to become the first female lawyer to practice law in the federal courts and the first woman to argue a case before the Surpreme Court. Now we've got those rights and it would be a shame not to exercise them. I don't intend to discuss politics on this blog, but I will encourage you to go and vote tomorrow. A vote is a powerful thing. Women have had the vote for less than a century. I certainly feel like I owe it to those suffragettes to cast my own ballot. I don't care who you vote for, but please vote! And since you can't vote until tomorrow, you might as well check out Nonfiction Monday in the meantime. :) Anastasia's got the round-up. It is election day and I AM VOTING thanks to the courage of countless suffragettes! Can you even imagine NOT being able to vote? It saddens me that so few people know ALL of the suffering that our suffragettes had to go through, and what life was REALLY like for women. Now you can subscribe FREE to my exciting e-mail series that goes behind the scenes in the lives of eight of the world's most famous women to reveal the shocking and sometimes heartbreaking truth of HOW women won the vote. Dramatic, sequential short story e-mail episodes have readers from all over the world raving about the original historical series, "The Privilege of Voting."